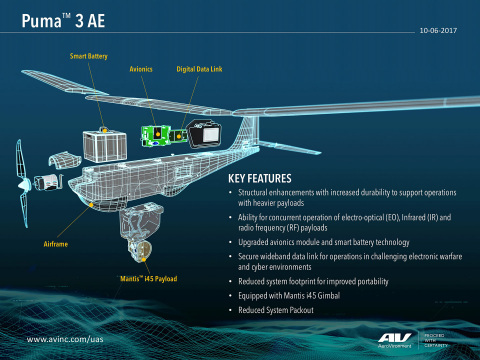 Association of the United States Army Annual Meeting and Exposition – AeroVironment, Inc. (NASDAQ: AVAV), a global leader in unmanned aircraft systems for both military and commercial applications, today announced that its Puma™ AE and Raven® small unmanned aircraft systems, the most widely deployed UAVs in the United States Department of Defense fleet, are being enhanced with new upgrades. The new aircraft, Puma 3 and Raven 3, will be unveiled at the AUSA Global Force Symposium in March 2018. The upgrades, which are being briefed in a series of customer meetings at AeroVironment’s booth (#201) here this week, include durability enhancements to the aircraft to operate in more rugged environments, improved ability to support advanced third-party payloads and software applications and enhanced performance in challenging radio electronic warfare/cyber environments where interference is prevalent. The next-generation avionics suite on the Puma 3 and Raven 3 will include specialized processors to support advanced navigation techniques and third-party algorithms. Additionally, customers will be able to interface with next generation GPS modules for operation in GPS-challenged environments. Both aircraft will have an improved inertial measurement unit to enhance their flying capability. Puma 3 features enhanced composite structures to support landing with heavier configurations and at higher altitudes. Puma 3 will incorporate a new, more efficient smart battery as well as enhancements to battery safety. Puma 3 will also reduce the system’s footprint from six transport cases to four, and will feature a flyable configuration in a single transport case with a luggage-type handle for improved portability. Finally, Puma 3 and Raven 3 will be equipped with Digital Data Link (DDL) security upgrades to support operation in more challenging RF environments and will include M1/M2/M5 radio frequencies to conform seamlessly and securely to the Department of Defense’s new frequency spectrum allocation.